One of our favorite spaces in the house, the kitchen can also be one of the most predictable. After all, it typically contains some countertop space, a few appliances and lots of storage. But a little imagination and some inventive styling can softly steer this room toward a look filled with personality. These smart details — some of them integral to the design, some added later — bring a fresh, original feel to a much-loved room. 1. Add a copper sink. 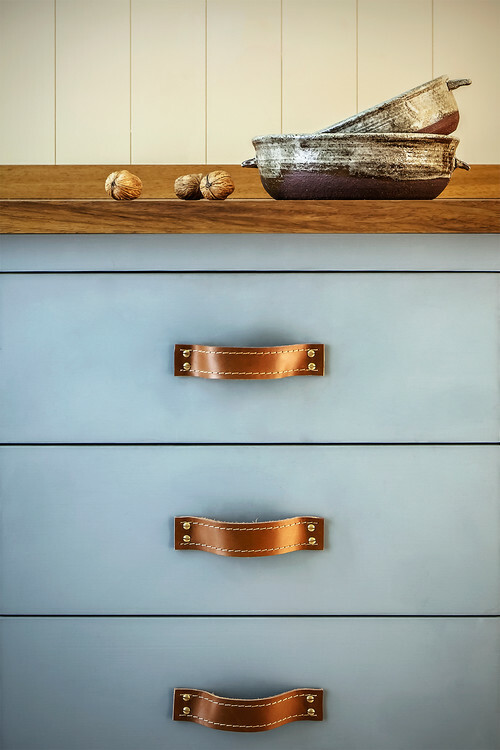 Copper is a hugely popular material, with a long history of use in the kitchen. Often it shows up in pots and pans, but here it’s been fashioned into a sink. 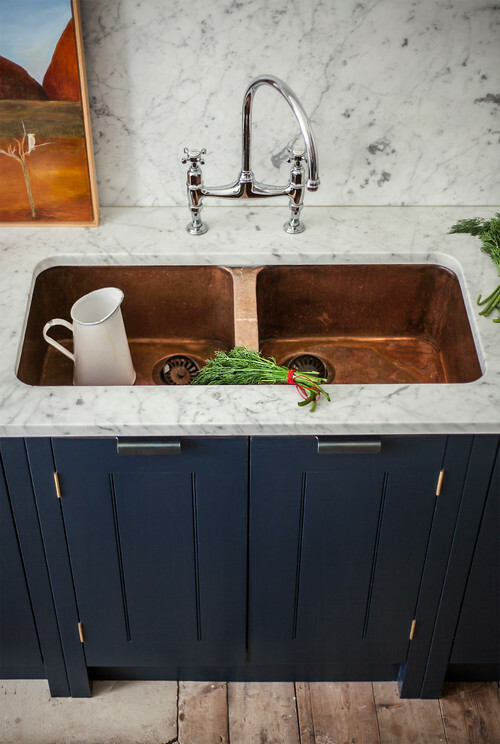 More humble than marble and nicely artisanal in feel, a copper sink is an unusual, stylish choice. 2. Seek out alternative handles. 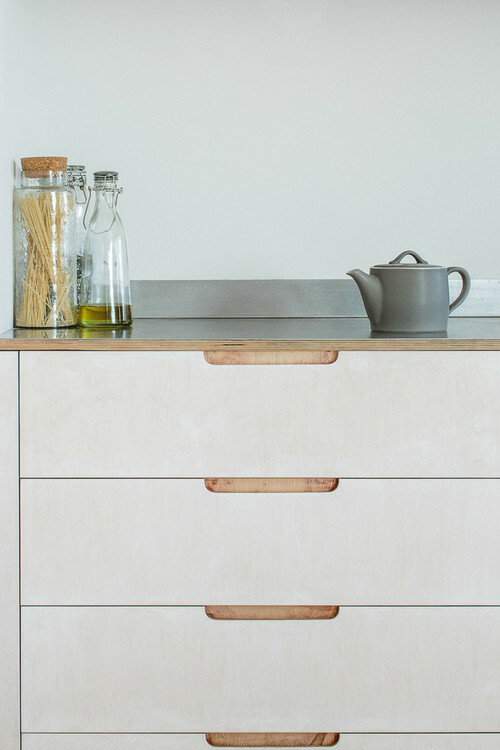 Metal, wood and ceramic are familiar choices for handles and knobs, so going with something a little more unusual will help give your kitchen its own style. Here, leather strap handles blend beautifully with the wooden counter, but it’s the element of surprise they carry that really catches the eye. 3. Light it up. Kitchens often feature integrated spotlights and task lighting, but adding a more decorative table lamp to a work surface or sideboard can instantly give a very different feel to the room. 4. Soften stainless steel. Stainless steel is a great material for a countertop and much-used in professional kitchens. This kitchen shows how it can be made to look soft and neat rather than seriously industrial when framed by the plywood trim of the cabinets. 5. Hang some art. 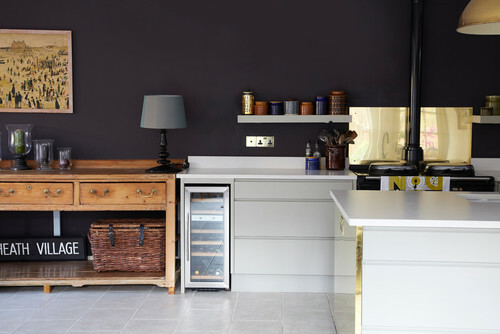 In the quest to make a kitchen practical, we sometimes forget to style it like any other room. Hanging art in the kitchen, close to units and equipment, extends the style found in other areas of the house into this very practical space. The framed painting seen here beautifully matches the cabinets and backsplash. 6. Make it mirrored. Antiqued mirrored glass brings a softly reflective element to a room and makes a wonderful material for a backsplash. It’s practical and easy to wipe down, but it also boosts the feeling of space and creates depth. 7. Work with paint. 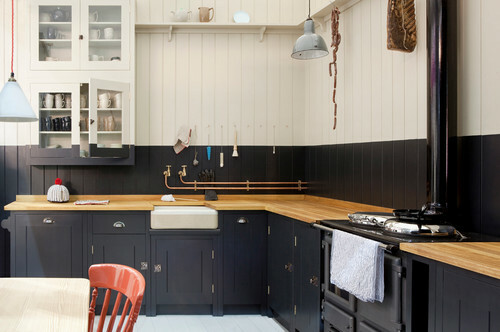 A kitchen with paneled walls is the perfect canvas for a creative paint job. 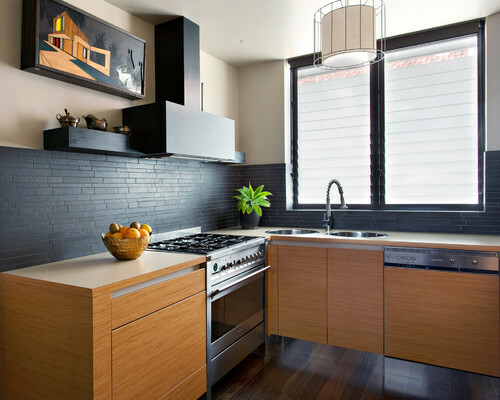 Use paint to create the illusion of a backsplash running around the entire room. You can even include the lower cabinets, as shown here. 8. Create a cool toe kick. Toe kicks can be something of an afterthought and generally match the cabinets above, but that doesn’t have to be the case. Here, a stainless steel toe kick creates a reflective, almost glowing strip at the base of these wooden units. It’s a nice, subtle contrast of materials. 9. Add a vintage piece. 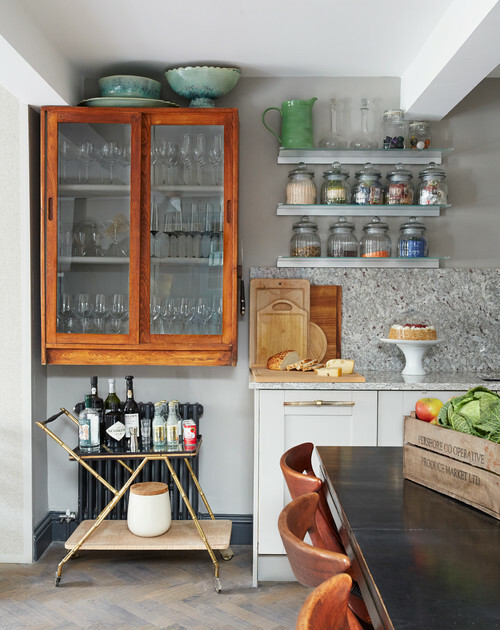 Teaming up contemporary and vintage pieces is a mix-and-match approach that works brilliantly in other rooms but isn’t often used in the kitchen. Hanging a vintage display case to supplement built-in contemporary cabinets adds loads of personality, not to mention lovely visual variety. 10. Integrate herb storage. Pots of fresh herbs cluttering up your windowsill? Who says they always have to be kept there? 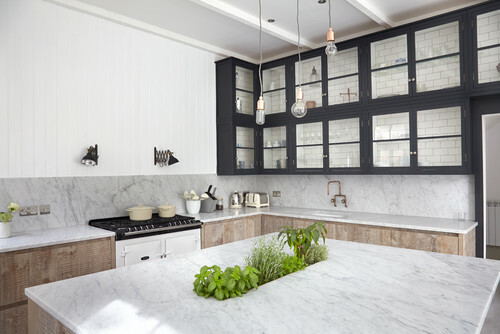 A clever alternative is to design an integrated trough into a counter where the herbs can neatly sit. A simple open rack, hung on the wall, is another good alternative.